These four short stories (and more) will feature as part of the movie. More than 30 years after the terrifying book series was published, Scary Stories to Tell in the Dark is getting a big screen adaptation shepherded by supernatural horror master Guillermo del Toro. During Sunday night’s Super Bowl LIII, four short teaser trailers for Scary Stories to Tell in the Dark aired. The movie features an original script by Guillermo del Toro unifying several short stories from the series. Del Toro also serves as producer with André Øvredal directing. The original Scary Stories to Tell in the Dark books written by Alvin Schwartz and illustrated by Stephen Gammell were published in 1981, 1984, and 1991. Each contains between 25 and 28 short horror stories drawing heavily from folklore and urban legends. They involve lots of violence, murder, and cannibalism, and virtually every story has a grim ending. They’re so unsettling, in fact, that they remained on the American Library Association’s top 10 list of challenged books for more than 20 years running, even appearing yet again as recently as 2012. The new film adaptation will weave an undisclosed number of these stories together with some original plotting from del Toro, unified under the premise of a group of teens trying to solve a mystery after “a wave of spectacularly horrific deaths” plague their hometown. So based on the Super Bowl teasers, which specific Scary Stories can we expect from the movie? Here’s a breakdown of each individual teaser. Did this kid actually eat the toe? In the first teaser, dubbed “Big Toe,” an undead women whispers, “Who took my big toe?” Sure enough, she’s missing the big toe on her left foot. A teenaged boy hides under a bed, but he’s grabbed from behind and dragged away. This one’s obviously based on the iconic Scary Stories short story also titled “The Big Toe.” In that, a starving young boy eats a human toe he finds in the ground, and then its owner attacks him in the dead of night. We’re not sure the cannibalism aspect of the original story will make its way into the movie, but at the very least, that kid totally takes the dead woman’s toe. Who is this jangly man and is he related to 'A Quiet Place' monsters? Of the four new teasers, the Jangly Man is the only totally new piece of plotting. A very nervous-looking teen says, “We’re next.” to his female friend over and over. Then, in some kind of barn, a different character is seemingly attacked by a monstrous humanoid with giant spider arms. We’re assuming that’s the Jangly Man himself, and his arms make him look a little bit like the monsters from A Quiet Place. Is there some kind of otherworldly force that’s causing these supernatural undead creatures to appear? Is it a portal to hell? Another dimension? She looks like she's related to the Devil With the Yellow Eyes from 'Legion'. The third TV spot, titled “The Pale Lady,” shows one character inside an empty school. The main lights go out, leaving only the blood-red emergency lighting. A bloated, monstrous figure moves closer to him without actually moving, as if teleporting. The pale face, black hair, and black eyes resemble the original illustration in impeccable detail, complete with the massive, toothless mouth and lack of any defining shapes. In that story, the ghastly figure haunts a girl’s dreams, where she says, “This is an evil place. Run away while you still can.” The Pale Lady just kind of stalks the girl’s dreams, grabbing her arm and waking her up out of the dream. Could the Pale Lady be something more malevolent here? "The Red Spot" shows a very nasty-looking spider bite. In perhaps the single most unsettling of the TV spots, a young woman shuffles through the high school. (The same school as “The Pale Lady” teaser, we’re assuming.) She examines what looks like a spider bite on her face only to find that there’s a living spider inside the massive welt. Original illustration for "The Red Spot"
In the short story also called “The Red Spot,” a young woman is bitten on the cheek by a spider, and after several days the welt bursts open and a bunch of spiders come crawling out. 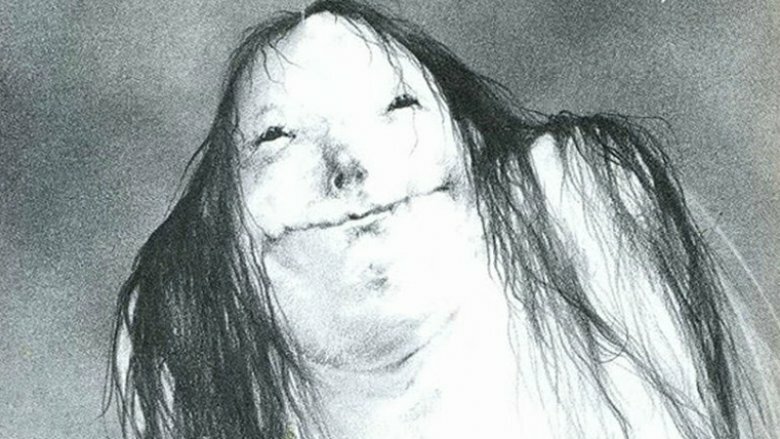 Though not featured directly in any of the new teasers, Harold is serving as the de facto mascot of the Scary Stories to Tell in the Dark movie. In the short story bearing his name, Harold is a scarecrow that comes alive and eventually skins one of the two farmers that own him. Gross! Could Harold murdering one or more farmers be the mysterious murder that kicks everything off in the movie? We’ll have to wait to find out, but it sure seems like he’ll play a prominent role.